Lion to Release Improved "Ban Refresh Shower Sheets," Which Are Blended with Nano Ion Absorbing Powder and Effectively Wipe Away Sticky Perspiration and Odor Using Newly Developed "Thick, Dimpled Mesh Sheets"
Lion Corporation (President Itsuo Hama) announces the nationwide release, on Wednesday, February 8, 2012, of the improved Ban Deodorant Roll On—which features a long-lasting deodorant effect—and the upgraded Ban Refresh Shower Sheets, a new product that can effectively wipe away sticky perspiration and odor. Lion will also add Pink Plumeria and Aqua Sparkle fragrances to its Ban Deodorant Powder Spray series in February 2012. A Lion survey in 2011 revealed changes in women’s behavior regarding odor prevention, with 32% of respondents indicating that they use antiperspirants and deodorants several times a day, 39% using more than one type of antiperspirants and deodorants, and 49% using such products throughout the year. Accordingly, the survey indicates that women make use of antiperspirants and deodorants depending on their lifestyle. By product, 74% of roll on-type deodorant users tend to focus on the long-lasting effect, while 73% place importance on preventing sweaty smell, both of which indicate users’ expectations about dispelling their anxiety about odor. On the other hand, 92% of respondents use sheet-type deodorants because they expect to feel refreshed after use and in order to control odors; 91% anticipate the prevention of stickiness on the skin; and 88% expect to have smooth skin. The survey revealed that all respondents expect products to effectively wipe away sticky perspiration and prevent odor. 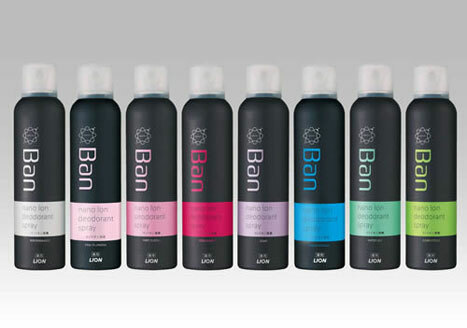 In addition, Lion garnered a high reputation due to the adoption of a stylish black package design for the Ban series in 2011 and for the deodorizing effect of nano ions. Spurred by this, in 2012, Lion will present the following lineup to offer deodorant care "anytime, anywhere" depending on one’s lifestyle. 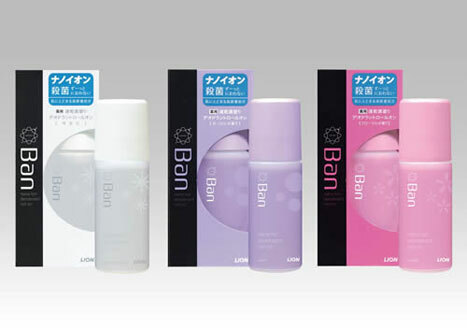 Effectively utilizing various types of items in accordance with time, place and occasion, the Ban series has introduced a "nano ion style" deodorant that supports people’s everyday life in any outfit or activity. This roll on-type product provides a long-lasting deodorant effect thanks to nano ion sterilization and active ingredients that adhere even more firmly to the skin. This highly refreshing sheet-type product features newly developed "thick, dimpled mesh sheets" and nano ion absorbing powder, which effectively wipe away sticky sweat and odors. Providing a long-lasting deodorant effect thanks to nano ions, this spray-type product is also available in Pink Plumeria and Aqua Sparkle. These additional fragrances have become popular among women. (1) Ban Deodorant Roll On is blended with a nano ion antibacterial agent (benzalkonium chloride), and an antiperspirant component (aluminum chlorohydrate). In addition, this product features two additional active ingredients that enhance adherence to the skin, providing superior, long-lasting deodorant effect. The nano sized antibacterial agents spread on the skin to kill odor-producing bacteria. Odor-producing bacteria have a negative electric charge. Therefore, positively charged nano ion antibacterial agent binds to odor-producing bacteria, breaking down such bacteria to enable sterilization. After that, the retention-enhancing ingredient covers the skin like a veil to adhere the active sterilizing and antiperspirant ingredients to the skin, thereby providing long-lasting deodorant effectiveness. 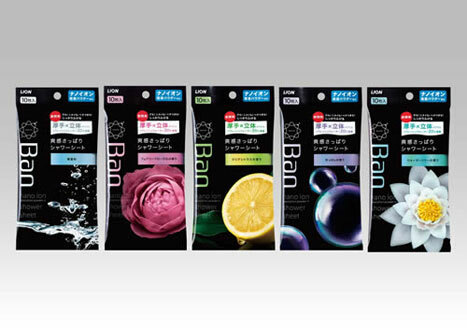 (2) Ban Deodorant Roll On adopted a stylish and easy-to-carry plastic bottle. (3) The "quick-drying formula" leaves the skin fresh and free of stickiness, making Ban Deodorant Roll On suitable for outdoor use. (4) Ban Deodorant Roll On features a lineup of three fragrance varieties. Available in "Unscented," "Floral" and "Soap." Lion adopted a thicker, three-layered sheet for greater effectiveness. An exceptionally strong fiber that resists crumpling is sandwiched between fiber layers that are soft to the skin. This design makes Ban Refresh Shower Sheets 25% thicker than the existing deodorant sheets. Accordingly, the thick sheet can effectively wipe away perspiration, sebum and stickiness, and holds up despite vigorous wiping. (3) The refreshing moisture-rich formula provides a long-lasting cooling sensation. The plentiful, refreshing moisture content of each sheet covers the skin, leaving a long-lasting, cool, refreshing sensation. (4) A five-fragrance lineup offers a choice according to preference. Five varieties of fragrances are available: "Unscented," "Fairy Floral," "Clear Citrus," "Soap" and Water Lily." (1) Spreading evenly over the skin, nano ion particles (zinc oxide) absorb odor molecules and, in turn, display a high degree of deodorizing power. Bursting open upon contact with perspiration, the nano ion particles included in Lion’s proprietary deodorizing powder spread evenly to all areas of the skin, effectively absorbing odors at their source. Fatty acids account for the odor molecules that people find most unpleasant about typical body odor. The most offensive fatty acids are short-chain fatty acids known to give off odors even in small amounts. Because nano ion particles have a positive electric charge, negatively charged odor molecules are absorbed, neutralized and thus eliminated. (2) The antibacterial agent isopropyl methylphenol (IPMP) and the antiperspirant component aluminum chlorohydrate (ACH) are blended for long-lasting deodorizing effectiveness. (3) In addition to the two new trendy fragrances, "Pink Plumeria" and "Aqua Sparkle," Ban Deodorant Powder Spray features a lineup of eight fragrance varieties, offering a choice to match each preference. The Ban Deodorant Powder Spray also features "Unscented," "Fairy Floral," "Rosé Cherry," "Soap," "Water Lily" and "Clear Citrus."